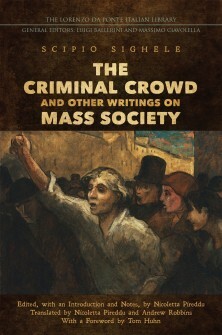 The so-called “age of crowds” still evokes primarily the late nineteenth-century French context, with the frightening popular uprising leading to the Paris Commune, the numerous disturbing images of masses in novels by Balzac, Sue, Maupassant, Zola, Huysmans, and Adam among others, and Gustave Le Bon’s renowned volume The Crowd: A Study of the Popular Mind (1895). Yet, four years before Le Bon, Italian jurist, sociologist, cultural and literary critic Scipio Sighele (1868-1913) had published La folla delinquente. Saggio di psicologia collettiva [The Criminal Crowd. An Essay on Collective Psychology], to be followed by other pioneering explorations of group behavior and of the power of suggestion upon collective crime. This volume offers the first English translation of Sighele’s seminal work and of excerpts from his subsequent writings in the domains of sociology, psychology, law, politics, and literary criticism: La coppia criminale [The Criminal Couple], La delinquenza settaria [Sectarian Criminality], L’intelligenza della folla [The Intelligence of the Crowd], La donna nova [The New Woman], Eva moderna [Modern Eve], Letteratura tragica [Tragic Literature], and Nell’arte e nella scienza [In Art and in Science]. A comprehensive introduction by Nicoletta Pireddu contextualizes Sighele’s overall contribution as a public intellectual negotiating between tradition and modernity in the European fin de siècle, able to grasp both the destructive and the constructive power of masses. This collection draws the multifaceted portrait of a provocative and problematic thinker who, by participating in crucial international debates, brings to post-unification Italy a new outlook on paramount issues like the role of urbanization in the development of criminality, the unstable borders between individual and collective accountability in mass society, the legal and ideological constraints in the education and emancipation of women, the social and institutional challenges to the care and upbringing of children, and the responsibility of literary representation in the relationship between aesthetic standards and ethical norms. Cover image: Honoré Daumier, The Uprising (L'Emeute), 1848 or later, The Phillips Collection, Washington DC. Nicoletta Pireddu is Professor of Italian and Comparative Literature at Georgetown University. Her research focuses on European literary and cultural relations, intellectual history, and translation studies, and has been supported by fellowships from the National Endowment for the Humanities, the Howard Foundation and the Borchard Foundation. For the « Lorenzo Da Ponte Italian Library » she also edited Paolo Mantegazza, The Physiology of Love and Other Writings (2007). Other book-length publications include The Works of Claudio Magris. Temporary Homes, Mobile Identities, European Borders (2015), Antropologi alla corte della bellezza. Decadenza ed economia simbolica nell'Europa fin de siècle (2002), for which she received the American Association for Italian Studies book award, and the edition of Paolo Mantegazza’s The Year 3000. A Dream (2010).